At just over 154°F Emerald Pool is cooler than many of Yellowstone’s other thermal features. This relatively lower temperature has allowed yellow colored bacteria to thrive around the edge of the pool. The clear water of the pool reflects blue, like most other pools in Yellowstone, but when the blue mixes with the yellow in the fringe, a deep green color appears giving this colorful feature its name. 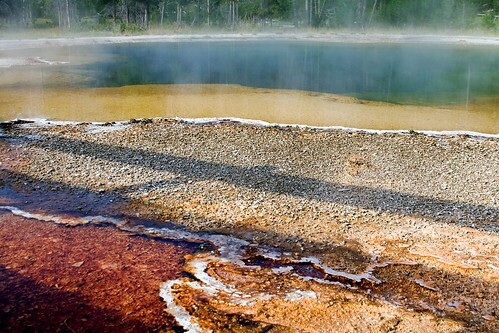 The outer edge of the pool has orange and reddish colors from the different types of bacteria which live in the cooler waters further away from the pool. This entry was posted on June 3, 2008 at 1:36 pm and filed under Black Sand Basin, Emerald Pool, National Park, pool, steam, thermal, Upper Geyser Basin, vacation, Wyoming, Yellowstone, Yellowstone National Park.